The Historical Society of Rockland County is a nonprofit educational institution and principal repository for original documents and artifacts relating to Rockland County. Its headquarters are a four-acre site featuring a history museum and the 1832 Jacob Blauvelt House in New City. The HSRC has seen many changes over the past 53 years in Rockland County. What does not change is our gratitude for your support and our commitment to making the vibrant history of Rockland available and widely accessible. Rockland is rich in history. Our mission—then and now—is to save and share it. This is the time of year we give thanks. Help us keep enriching your life and the life of our Rockland community. 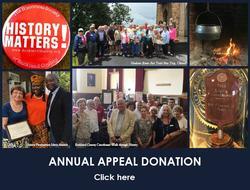 Please consider making a generous donation to this year's Annual Appeal! Your gift is greatly appreciated and tax-deductible to the extent provided by law. To make a safe, secure online contribution, click here.